From November to April, and on many days in October and May, the weather in the Phoenix, Arizona area is picture perfect. 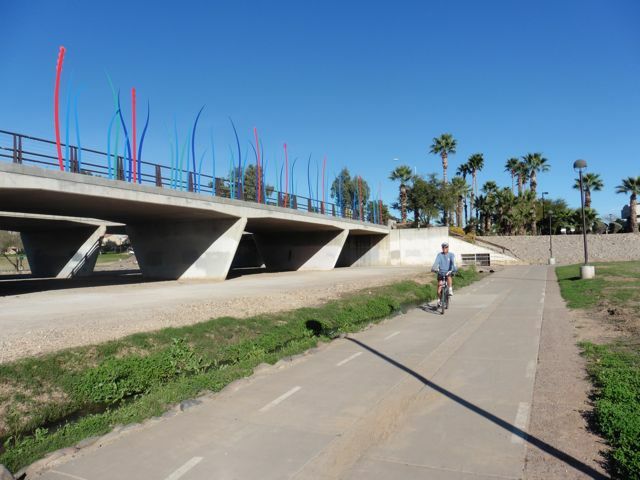 While the most scenic areas are in the natural Sonoran desert parks in the outskirts of the city and best suited to be seen by mountain bike, there is an extensive network of pleasant bike trails throughout the city, many adjacent to a system of canals and drainage channels that traverse the area. 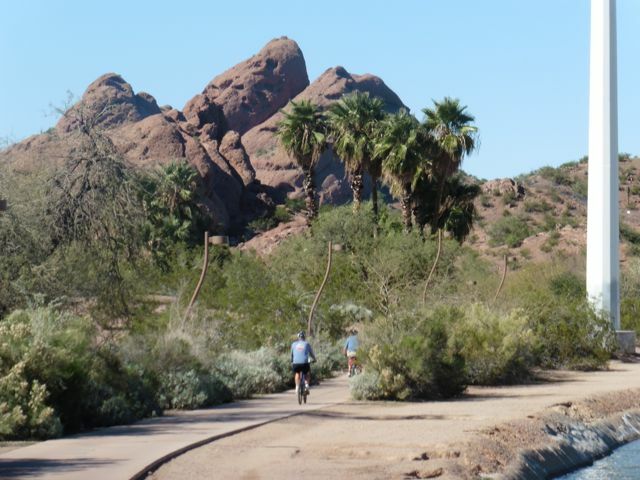 Most consider the trails along the Scottsdale Greenbelt and Tempe Town Lake next to Arizona State U to be the best and scenic of these paths. We have explored these paths, and combined with a route along pleasant canal-side trails to come up with a 22-mile scenic loop with plenty of highlights along the way, including the rock formations of Papago Park, the new developments along the Arizona Canal in Scottsdale, a side trip to Old Town Scottsdale and two interesting bike-ped bridges. 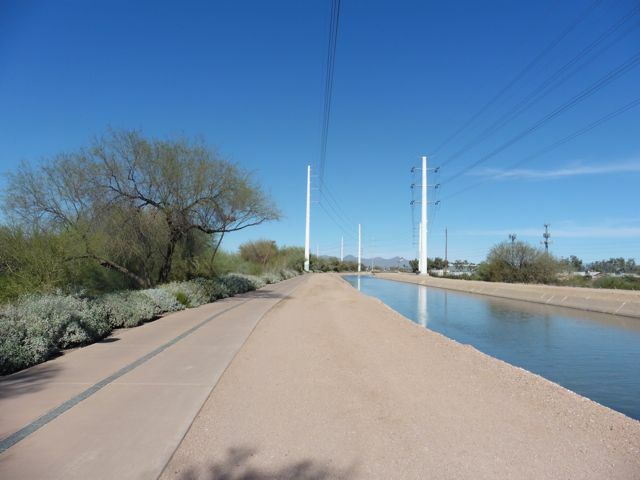 The final link in the loop was recently completed along the Arizona Canal Trail in Scottsdale, making this a world-class urban loop ride. 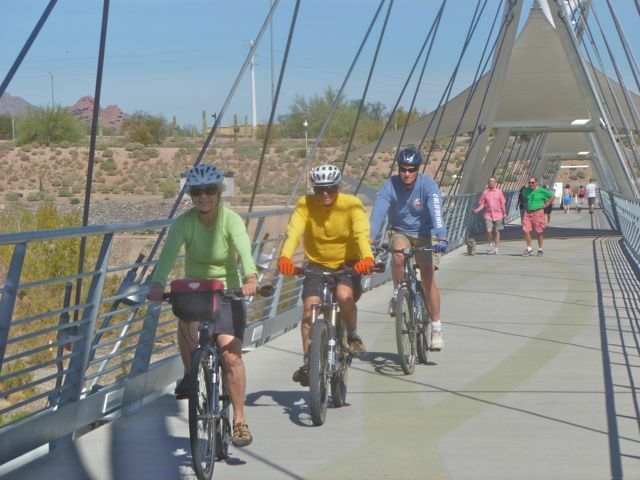 A highlight is the fabulous new ped-bike bridge over Tempe Town Lake. 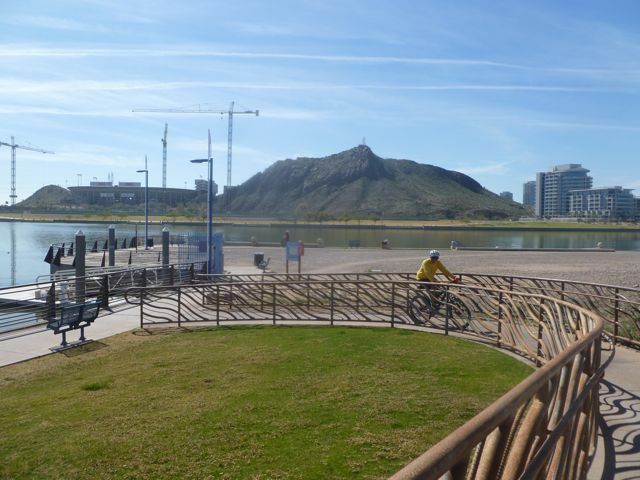 Cycling along Tempe Town Lake, with ASU’s mountain in the background. The Crosscut Canal trail makes a nice N-S connector between Tempe Town Lake and the Arizona Canal. Scenic portion of Crosscut Canal Trail near Papago Park. 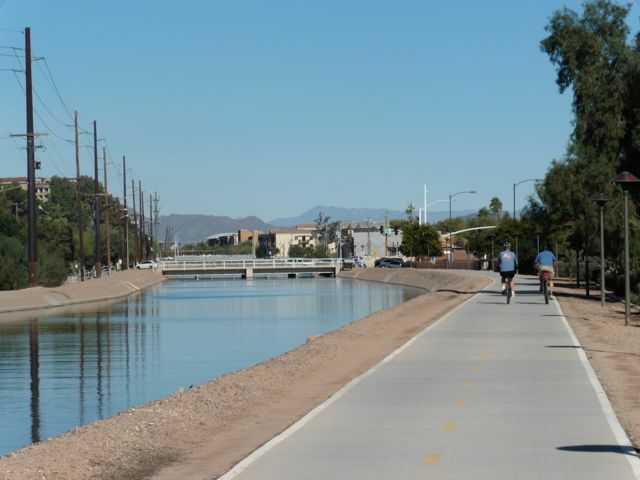 The Crosscut Canal Trail connects to the Arizona Canal Trail shown here. 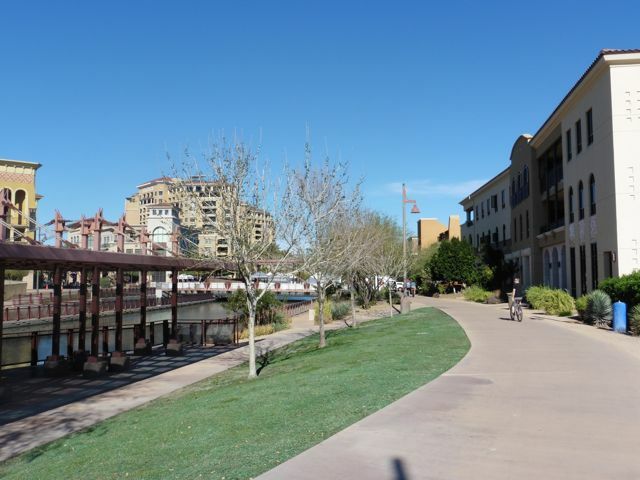 Arizona Canal Trail through downtown Scottsdale’s “Waterfront” district. 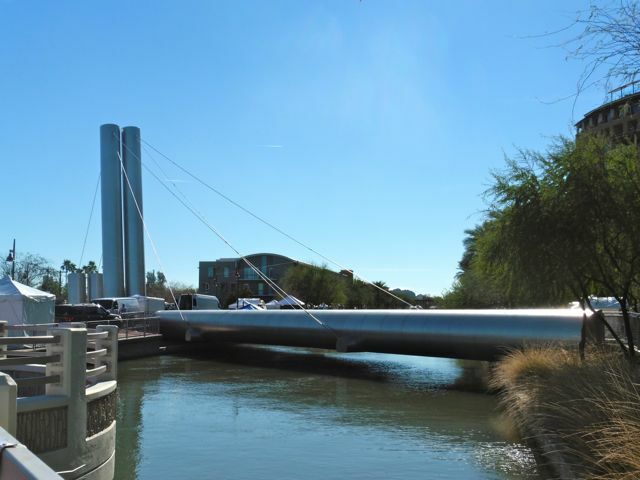 Interesting Soleri bike-ped bridge over Arizona Canal along the “Scottsdale Waterfront”. The trail between this point and Indian Bend Wash Trail was previously packed gravel, but it has become a paved pathway with signaled street crossings, vastly improving the route. 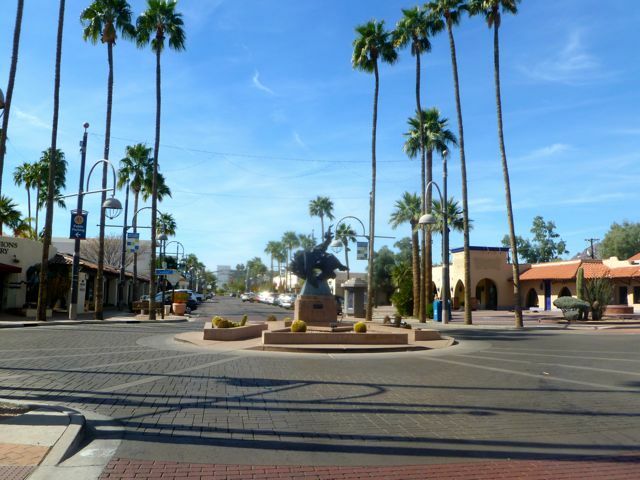 A few blocks on surface streets from either the AZ Canal Trail or the Indian Bend Wash Trail brings you to tourist favorite Old Town Scottsdale. 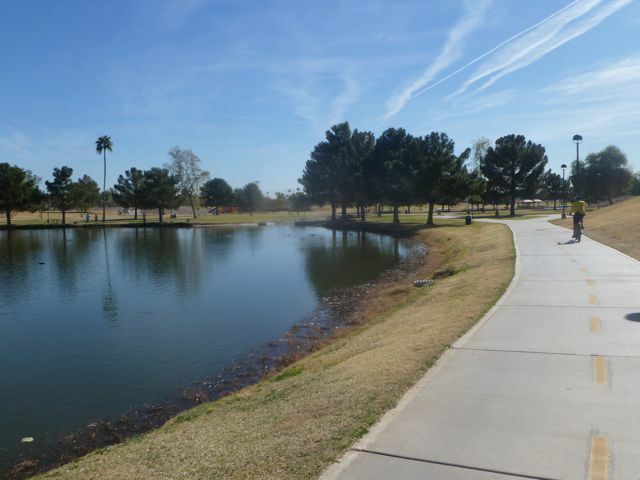 The AZ Canal Trail feeds into the Indian Bend Wash Trail through the Scottsdale Greenbelt. Interesting bridge art along Indian Bend Wash Trail. Previous PostScenic Sedona Bike ‘n BrunchNext PostMORRO BAY’S NEW BRIDGE AND PATH IS A BOON TO CYCLISTS!